As a nurse at Royal Oak Beaumont Hospital, Len Kincaid wants to make sure people are living healthy lifestyles. But even as he encouraged patients to quit smoking, he was struggling with his own long-term tobacco habit. Nothing seemed to be working — until he tried electronic cigarettes a year and a half ago. Now Kincaid has two jobs: After his shift at the hospital ends, he heads to Vaporcraft Electronic Cigarette Specialists in Clawson, a shop and “vaping” lounge he opened with his wife, Barbara, in April. Demand is high at the shop, and the trend is growing across the country, according to figures from Bloomberg Industries. The devices began appearing around 2006. They are expected to account for as much as $1.7 billion in sales this year, according to the forecasting firm, which says tobacco cigarettes are an $80 billion-a-year industry. The firm predicts e-cigarette sales will surpass traditional cigarette sales by 2047. And as the popularity of “vaping” grows, debate continues over possible health effects of smoking the electronic devices. Health officials warn that the cigarette substitute, while tobacco-free, delivers nicotine, an addictive substance that raises a user’s heart rate and blood pressure, according to the National Institutes of Health. “Based on the studies that have been done, it’s not a safe alternative,” said Angela Minicuci, a spokeswoman for the Michigan Department of Health. Advocates for e-cigarettes say they allow smokers to transition away from tobacco, which has been linked to cancer and emphysema. E-cigarettes come in a variety of models and styles but all are battery-powered devices that provide inhaled doses of nicotine through a vaporized solution. At the Kincaids’ shop, models cost $41 to $200, and accessories and “e-juice” — liquid nicotine that fills an e-cigarette cartridge — add to the cost. 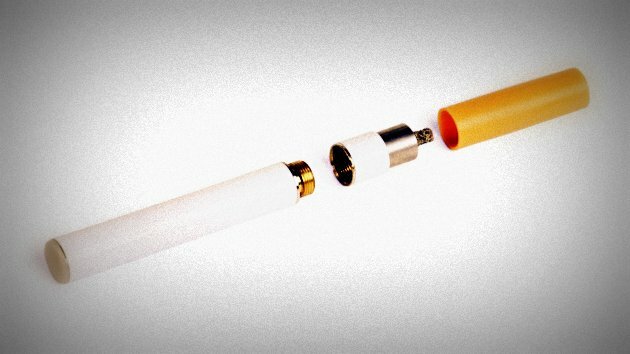 Some people prefer disposable e-cigarettes, which can cost as little as $3 per unit. A pack of regular cigarettes costs $6.54 in Michigan, according to the American Lung Association. The Federal Drug Administration appears to be on the cusp of regulating e-cigarettes, but at least for the time being, there’s nothing preventing sales to minors in Michigan or 29 other states. Many shop owners, including the Kincaids, refuse to sell to anyone under age 18. E-cigarettes aren’t covered under Michigan’s Smoke-Free Air law, which prevents smokers from lighting up inside businesses and bars. At Central Michigan Univeristy, electronic cigarettes have been banned in residence halls and in most areas on campus since 2010. “The decision was made because the FDA still hasn’t made a decision on the safety of them, so until it’s done, we’re going to treat it as if it’s second-hand smoke,” said Shaun Holtgreive, executive director of campus life at the Mount Pleasant school. Vaping is just as successful as nicotine patches in helping smokers break the habit, according to a study completed by researchers in New Zealand and released last month in the medical journal The Lancet. But according to a study by the Centers for Disease Control and Prevention, a growing number of children are being introduced to nicotine through e-cigarettes. The CDC report, released this month, is the first large national study to gauge use by middle and high school students. It found use by those groups doubled between 2011 and 2012. About 2 percent of the students said they had used an e-cigarette in the previous month, according to a survey done last year. That was up from 1 percent in 2011. The study is based on a questionnaire filled out by nearly 19,000 students in grades 6 through 12 in 2011 and another 25,000 in 2012. More young people smoke traditional cigarettes than the new electronic ones, according to the report.But the study seems to indicate some children are starting with electronic versions and then moving on to tobacco products. The CDC study showed that 20 percent of middle school vapers and 7 percent of high school vapers had never tried conventional cigarettes. Electronic cigarettes come in a variety of flavors, which can appeal to children, said Dr. Samuel A. Allen, a pulmonary and critical care specialist with Beaumont Hospital. Allen said he doesn’t recommend e-cigarettes to his patients who are trying to quit smoking, but if they insist on using them, he shows them how to gradually swap out regular cigarettes. Some users swear by the devices, like former trial lawyer Don Petrulis, who started smoking again when he retired, four years after quitting. “My wife said, ‘Uh uh, you’re not going back there. Why don’t you try those electronic cigarettes,’” said Petrulis, 69, who lives in Troy. A month in, he swears by his plastic, disposable substitute, saying he’s got no more craving and feels better. “If you’ve got to smoke, this is the best alternative,” he said.